The United States expressed fresh concern about North Korea after Pyongyang indicated renewed nuclear activity that would allow it to churn out at least enough plutonium for one bomb annually. The announcement, made by North Korea’s Atomic Energy Institute, in a written response to Japan’s Kyodo News agency, confirms what the intelligence community, academics and analysts have been asserting for months: Pyongyang has made good on its vow to resume activities at the Yongbyon nuclear complex. “If these reports are correct, it is obviously a clear violation of U.N. Security Council resolutions, which prohibit such activities,” State Department deputy spokesman Mark Toner said in response to a VOA question. The confirmation is not surprising and primarily timed to get attention as North Korea “needs to escalate tension and crisis,” said Kongdan “Katy” Oh, senior Asian specialist at the Institute for Defense Analyses in Alexandria, Virginia. North Korean leader Kim Jong Un, for domestic consumption and international relevancy, wants to tell the world “respect and treat me as a nuclear leader,” Oh, who regularly briefs U.S. government officials, told VOA. 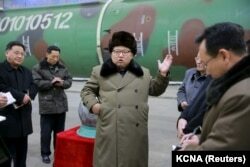 FILE - North Korean leader Kim Jong Un meets scientists and technicians in the field of research into nuclear weapons in this undated photo released by North Korea's Korean Central News Agency (KCNA), in Pyongyang, March 9, 2016. The 5-megawatt reactor and other facilities at Yongbyon were shut down under an agreement reached in 2007 involving North Korea and five other countries: the United States, China, Japan, Russia and South Korea. The North vowed in 2013 to resume activities 90 kilometers north of the capital. The International Atomic Energy Agency, a U.N. body, had no immediate public reaction, but officials there noted the announcement comes as no surprise. IAEA Director General Yukiya Amano told reporters in June that the Yongbyon reactor had been restarted, either for enrichment or reprocessing. The IAEA is to issue its annual report on North Korea’s nuclear activities in a few weeks, which will contain additional assessments of the reclusive state’s atomic activities. A uranium enrichment facility was revealed six years ago. In February of this year, U.S. Director of National Intelligence James Clapper said North Korea was expected to be able to harvest plutonium from Yongbyon with a matter of weeks. In May, analysts at the U.S.-Korea Institute at Johns Hopkins University said commercial satellite imagery indicated a reprocessing campaign to separate more plutonium for nuclear weapons was underway. 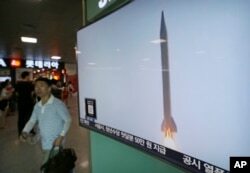 FILE - A man passes by a TV news program with file footage of a North Korean rocket launch at the Seoul Railway Station in Seoul, South Korea, Aug. 3, 2016. In its comments to Kyodo, the Atomic Energy Institute did not reveal the amount of plutonium or enriched uranium it had produced, saying Western analysts were free to draw their own conclusions. The activities are the latest in a series of defiant acts by North Korea amid numerous United Nations sanctions for its atomic and ballistic missile development. The report, carried by Pyongyang’s Korean Central News Agency (KCNA), quoted a foreign ministry spokesman saying the situation on the Korean peninsula had entered a “very grave phase” following the deployment to Guam by the U.S. Air Force of B-1B and B-2A bombers to compliment B52-H strategic bombers stationed there. Also angering Pyongyang is a move by the United States to deploy in South Korea a Terminal High Altitude Air Defense (THAAD) system to shoot down North Korean missiles. Earlier this month, a missile fired by North Korea landed in or close to waters of Japan’s exclusive economic zone, the latest in a series of such provocative launches. As far as the next steps under consideration by Washington, in lieu of the defiance of various international sanctions, “We continue to evaluate our options,” said Toner, at the State Department. North Korea has long indicated its ultimate quest to miniaturize a nuclear warhead that could be placed atop a guided missile capable of hitting the continental United States. A young and insecure Kim, in the shadow of his grandfather, Kim Il Sung, who founded North Korea, and his father, Kim Jong Il, needs to demonstrate his legitimacy and “that I’m in charge” and thus is seeking to stay relevant and maintain the world’s attention, Oh said. “It’s all a game for him,” she told VOA. Kim’s hardline government suffered an embarrassment Wednesday when South Korean officials revealed that a high-ranking North Korean diplomat posted in London had defected, reportedly stating he was “sick and tired” of the Pyongyang regime.